I have multiple problems with a custom calendar I've made for a shared team calendar. I am using Sharepoint Online, I read online that these use the version 2016. Just to clarify, I am by no means good at code. So, people understand the situation I will share the structure that lead to the widget being displayed on the front page. The problems are explained more in depth further down. Please find supporting code in the comments! I created a web part page with the Calendar being pulled in as a Calendar web part and a script editor to cut down space around the calendar so it fits better on the Main Page. The script editor I changed to have the width and height at 0 plus hidden so it doesn’t take up space in the widget boundaries. The time on the event is white and hard to see with a backdrop of yellow. Is it possible to change the font colour to black while keeping it white on the rest of events that aren’t yellow? How do I add these two sections to the web part so it will show up on the main page? I originally got rid of the scroll bars. However, adding code to extend the titles so the events with a long title will show up in the overview, this made it so some overextended the width of the calendar. How do I fix this? 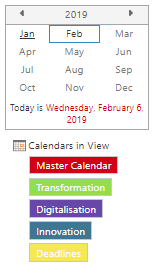 Make hyperlink "Master Calendar," inactive How do I make the title hyperlink “Master Calendar,” inactive? Add button not function for non-admins Only a certain number of people should be able to edit the calendar, how do I make it so nobody can do that but a select few? Browse other questions tagged list css calendar events embedded or ask your own question.